The economy of Antigua and Barbuda is largely dependent upon the services sector. Tourism accounts for more than 50% of the total GDP of the country. It is a member of WTO and CARICOM. 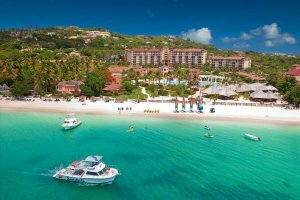 Antigua and Barbuda is famous for its many luxury resorts. Investment banking and financial services also make up an important part of the economy. Major world banks with offices in Antigua include the Royal Bank of Canada (RBC) and Scotiabank. 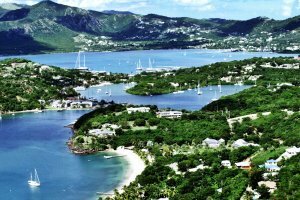 The top exports of Antigua and Barbuda are passenger and cargo ships, refined petroleum, soybean meal, scrap vessels, awnings, tents, and sails, bedding, handicrafts, electronic components, transport equipment, food. The top export partners of Antigua and Barbuda are Poland, Algeria, the United States, the United Kingdom and Guyana. Antigua and Barbuda is a twin-island country in the Americas, lying between the Caribbean Sea and the Atlantic Ocean. It consists of two major inhabited islands, Antigua and Barbuda, and a number of smaller islands. The capital and largest port and city is St. John's, on Antigua. Antigua and Barbuda, as islands, are dependent on shipping in vital supplies, and are therefore a net importer of goods and services. It net imports accounted for about 11% of GDP. The retail sector is dominated by the sale of food and beverages, clothing and textiles, and vegetables. The main markets are located in the capital, St. John's. There are many street vendors and duty-free shops. The government has been taking steps to improve this sector. The primary import goods of Antigua and Barbuda include food and live animals, machinery, transport equipment, manufactures, chemicals and oil. Other imports include planes, helicopters, spacecraft, cars and poultry meat. The top import partners of Antigua and Barbuda are the United States, Poland, France, Belgium-Luxembourg and Ghana. Address: Long Street, St.John's , Antigua W.I. Antigua and Barbuda is a twin-island country situated between the Caribbean Sea and the Atlantic Ocean. It consists of two major inhabited islands, Antigua and Barbuda, and a number of smaller islands. The country is a member of the United Nations, the Bolivarian Alliance for the Americas, the Caribbean Community, the Organization of Eastern Caribbean States and the WTO. 1. Acquire an Import Permit from the Antigua & Barbuda Ministry of Agriculture, Plant Protection Unit. 2. Register as an Exporter with the Guyana Marketing Corporation and the National Plant Protection Organization (NPPO), National Agricultural Research and Extension Institute (NAREI), Mon Repos, East Coast Demerara. 3. Acquire a Taxpayer Identification Number (TIN) - This can be obtained from the Guyana Revenue Authority (GRA), Customs & Trade Administration Department. 5. Source Produce from Certified Farms - exporters should ensure that their produce are sourced from certified farming areas and farmers. Antigua and Barbuda are members of the Caribbean Community (CARICOM). Only slightly more than half of the members appear to have implemented the CARICOM common external tariff (CET) whereby goods entering any member country from nonmember countries will be assessed with the same tariff rate. Consequently, a wide range of applied tariff rates continue to exist across member countries. Customs value is based on the c.i.f. (cost, insurance, freight) value of the goods at the time of import and includes all other foreign costs. A Customs Service Tax (CST) of 10 percent is added to the import customs value. For most goods, an Antigua Barbuda Sales Tax (ABST) of 15 percent is levied on customs value plus the duty and the CST. Most goods can be brought temporarily into Antigua and Barbuda, though they must be registered with Customs at the port of entry. Sometimes a bond must be posted to ensure the re-export of the goods.